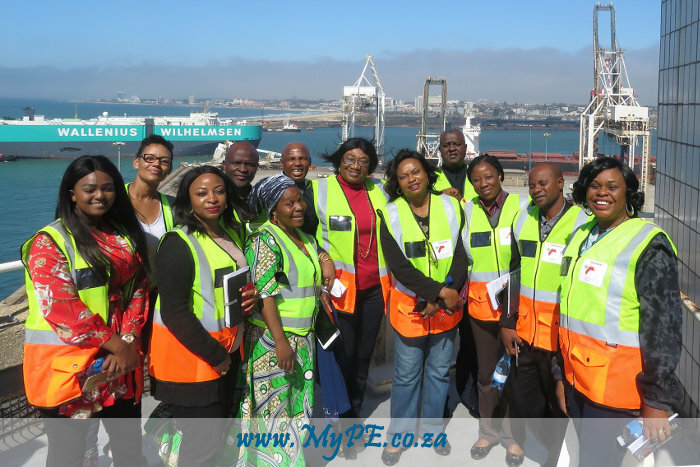 Olwethu Mdabula (TNPA Corporate Affairs Officer – far left) took the Nigerian delegation on board a vessel in the Port of Port Elizabeth. Collaboration in the interest of economic growth in Africa takes a further step forward this week when Transnet National Ports Authority welcomes delegates from the Nigerian Shippers’ Council (NSC) on a knowledge sharing visit to the Ports of Port Elizabeth, Durban and Cape Town. The delegation of senior managers arrived in Durban on Monday, 8 April for a tour of the port before arriving at the Transnet Maritime School of Excellence, where they are participating in a three-day workshop on the role of the Port Regulator. This followed by a visit to the ports of Port Elizabeth and Ngqura today and Cape Town tomorrow – Friday, 12 April, to gain first-hand experience of the ports in action and consolidate learnings from the workshop. Included on the agenda are numerous presentations covering capacity, legislation and regulatory policies, port performance score card, private sector participation in ports, port market analysis, environmental performance and impacts of climate change, the Transnet of tomorrow, pricing strategy and tariffs. Other topics include development of international trade and the evolving role of ports, future trends in policy, technology and regulations, global port management structures and ownership models, as well as other legal and regulatory developments affecting ports. Rajesh Dana, Port Manager at the Port of Port Elizabeth, said: “The visit gives us the opportunity to build a strategic relationship with the NSC and offers us the opportunity to identify areas within which the Nelson Mandela Bay Ports can partner and collaborate with the Nigerian Ports to grow trade in a safe, efficient, responsible and sustainable manner. This partnership will ensure that we utilise our world-class ports as a catalyst for economic growth and thereby position Africa to take up her rightful place in the global economy,” he added. The delegation will end their visit with a tour of the Port of Cape Town. “Visits like this give us an opportunity to partner with other countries in Africa as together we strive to deliver world-class port services in order to attract growing volumes of international trade. We look forward to developing the relationship with the Nigerian Shippers’ Council further,” said Mpumi Dweba-Kwetana, Cape Town Port Manager.